Second, examine what works based on observable success stories and leading practices. Third, set metrics to benchmark practice and performance accordingly. This Report represents a refinement and fuller elaboration of the Framework and accompanying metrics based on inputs received through numerous channels over the past year. The ultimate objective of national economic performance is broad-based and sustained progress in living standards, a concept that encompasses wage and non-wage income (e.g., pension or child care benefits) as well as economic opportunity and quality of life. This is the bottom-line basis on which a society evaluates the economic dimension of its country’s leadership. To borrow from a business concept, growth can be thought of as the top-line measure of national economic performance, with broad-based or median progress in living standards representing the bottom-line. Inclusive growth can be thought of as a strategy to increase the extent to which the economy’s top-line performance is translated into the bottom-line result society is seeking, i.e., broad-based expansion of economic opportunity and prosperity. Similarly, OECD research finds that an increase in inequality by three Gini points is correlated with a decrease in economic growth by 0.35percentage points per year for 25 years – a cumulative loss of 8.5%. 20 This is primarily because higher levels of inequality are associated with poorer households finding it harder to invest in health and educational opportunities, thereby lowering human capital accumulation and social mobility. 21 The economic threat of income inequality to a nation’s well-being lies primarily in the large bottom segment of society not advancing. In response to these findings, the OECD is working on a new metric of multidimensional living standards, in a bid to capture the well-being of societies more accurately. With its Human Opportunity Index, the World Bank is another influential organization increasingly turning its attention to what is needed in addition to economic growth to reduce poverty and share prosperity more widely. “Beyond GDP” refers to a longstanding debate within mainstream economics aimed at developing indicators of progress that are as clear and compelling as GDP but also more inclusive of other measures of well-being, including environmental, social, and quality-of-life aspects. There are two sets of issues in favor of moving beyond GDP: the limitations of GDP as a measure of output; and the limitations of using GDP as a measure of social and economic progress. GDP does not measure the overall standard of living or well-being of a country, concepts which are multidimensional and not solely contingent on economic factors. These include dimensions such as health, education, and employment, which are not adequately captured in a measure like GDP. It has been shown that after a certain point, increases in GDP will be offset by externalities such as increased inequality. 35 Given that GDP is monetized, it does not capture the full consumer surplus, which includes the non-monetary value of goods and services. For example, the time savings accrued through easy access to information through the Internet are not included in GDP. Intergenerational equity, which refers to whether economic performance is being pursued at the expense of future generations, is another limitation of GDP. Increasing output, which at first glance would be “good” for GDP, may come at the expense of externalities such as environmental damage, reduced leisure time, or the depletion of natural resources. 36 In other words, there is no link between GDP and the sustainability of the economy. In other words, a lot of good work has been done to frame a different way of thinking about economic progress. Yet, to date there have been few concrete proposals on how to manifest that thinking in a specific policy framework or growth model, on the one hand, and set of national economic performance metrics, on the other. This Report is intended as a concrete contribution in this regard. In recent years, many governments have been faced with the challenge of promoting stronger productivity growth, while also having to ensure that the proceeds are equitably distributed. New work on the “productivity-inclusiveness nexus” at the Organisation for Economic Cooperation and Development (OECD) examines this challenge in depth and puts forward a new policy framework to help governments address rising inequalities and slowing productivity growth. Since the beginning of the millennium, 90% of OECD countries have experienced a slowdown in labor productivity growth, in the wake of decades of rapid technological advancement. OECD analysis shows this slowdown results from a growing difference in performance between firms at the global productivity frontier – “frontier firms” – and their non-frontier counterparts.5-1 In manufacturing, the early 2000s saw labor productivity at the global frontier increase rapidly at an average annual rate of 3.5%, compared with just 0.5% for non-frontier firms. As explored elsewhere in this Report, recent decades have also seen widespread increases in inequality, in terms of both income and well-being. Inequalities of income, education, training opportunities, and health tend to feed each other, and also reduce productivity and growth. In particular, recent OECD evidence indicates that rising inequality has limited the ability of the bottom 40% to invest in knowledge and skill-building, worsening inequality and undermining potential productivity. Evidence also suggests that growing productivity dispersion across firms has caused widening of the wage distribution over the past two or three decades. In part, this may be down to rent capture by frontier firms and suboptimal resource allocation, which have limited productivity gains while entrenching inequalities of income. The OECD’s approach recognizes that making the productivity-inclusiveness nexus work for all will require a comprehensive policy framework to account for and address the multiple interactions between inequalities and productivity, and how these interactions play out across countries, regions, and firms, and between individuals. This will call upon governments to break down policy silos and focus on win-win policies to reduce inequalities and support productivity growth simultaneously, while addressing trade-offs. It will also necessitate stronger governance and regulatory mechanisms to combat issues like rent seeking and corruption. Achieving stronger productivity growth and reducing inequalities requires action to ensure that all people, and particularly those at the bottom, are provided with opportunity and equipped with skills to fulfill their productive potential. Beyond adequate social-safety nets and labor market-activation policies, this calls for effective education and skills policies to better match training with labor market demands and policies targeted at improving health and job quality. Businesses have a crucial role to play in making productivity growth both stronger and more inclusive by offering employment, contributing to effective skills development and use, and developing knowledge and technologies. To enable businesses to play this role, government must foster a policy environment that creates a level regulatory and financial playing field for all firms so as to support innovation and its diffusion throughout the economy. For example, government provision of unemployment benefits needs to be combined with inclusive policies that place a strong emphasis on “activation” to ensure that unemployment duration is reduced and human capital depreciation minimized, while also providing the most productive firms with the supply of skilled labor they need. Competition regimes must encourage new businesses, and much could be done to improve enforcement against global enterprises that violate competition laws, including through more cooperation on cross-border cases. Incumbents must be prevented from achieving regulatory capture that could allow them to exert undue influence over policy and regulatory frameworks. This would require evidence-based decision-making processes that take better account of impact assessment and public consultations while ensuring transparency. Many policies will need to be adapted to the circumstances of local places, calling for actions at the regional and urban levels. For instance, local conditions can be crucial to the effectiveness of efforts to improve labor-market conditions, such as by matching skills and training. In addition, local policy actions toward, for instance, ensuring sufficient and affordable housing and transport are essential to removing barriers that limit access to opportunity. The World Bank’s landmark 1993 study, The East Asian Miracle, 49 examined how eight economies in the region succeeded in achieving a remarkable record of “high growth with equity” from 1960 to 1990. In a chapter entitled “An Institutional Basis for Shared Growth,” its distinguished research team concluded: “Of course, few political leaders anywhere would reject, on principle, either the desirability of growth or that the benefits of growth should be shared. What distinguished the High-Performing Asian Economies’ leadership was the extent to which they adopted specific institutional mechanisms tailored to these goals, and that worked.” The team then documented the institutional approaches that contributed importantly to this positive outcome in such areas as education, land reform, small- and medium-sized business support, housing, labor-management relations, insulation of policymaking from rent-seeking behavior, integrity in public administration, and business-government relations. In fact, economic institution-building has been a crucial part of the development path of essentially every country that has industrialized and achieved high living standards. Because development is a complex and multidisciplinary process – many conditions need to be fulfilled in order for widespread poverty to be replaced by ever-rising middle-class prosperity – this process of institutional deepening occurs across a wide spectrum of domains. But the process is not automatic. Although rising national income generates additional resources and policy space to establish and effectively implement such institutional mechanisms as public education systems, independent judiciaries, labor protections, social insurance systems, competition, investment climate, anti-corruption rules and enforcement agencies, and basic and digital infrastructure, they do not guarantee it. The pace and pattern of economic institution-building is a choice, a function of policy decisions and public-private cooperation. Like other aspects of a country’s growth model, it is shaped by the prevailing political economy and is largely endogenous to the development process. Because it is a policy choice, the size of the payoff from economic growth to broad socioeconomic progress is as well, to a considerable extent. First and foremost, the practice of inclusive growth and development requires widening of the lens through which priorities are set in national economic strategies. Macroeconomic, finance and trade supervision policies remain critically important as they establish the conditions necessary for improvements in productivity that help drive growth. However, other areas are just as vital to the overriding purpose of economic policy: strong, sustained increases in broad living standards. What are the areas of policy and institutional strength that have a particularly strong bearing on social participation in the process (e.g., productive employment) and outcomes (e.g., median household income) of economic growth? 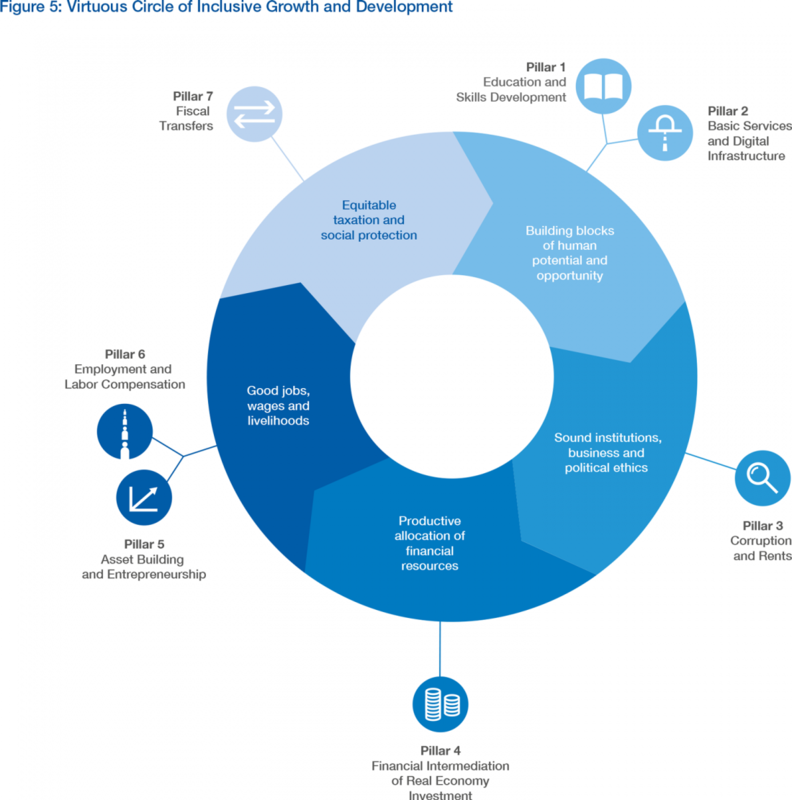 This Report presents a Framework and a corresponding set of indicators of policy and enabling environment conditions in seven principal domains (pillars) and 15 sub-domains (sub-pillars) (see Figure 4). Societies that have had particular success in building a robust middle class and reducing poverty and social marginalization have tended to create effective economic institutions and policy incentives in many of these areas, while supporting growth through sound macroeconomic policies and efficiency-enhancing reforms. These pillars and sub-pillars describe the spectrum of structural factors within a modern economy that particularly influence the breadth of improvement in living standards. A detailed description of each of the pillars is provided in Part 3. 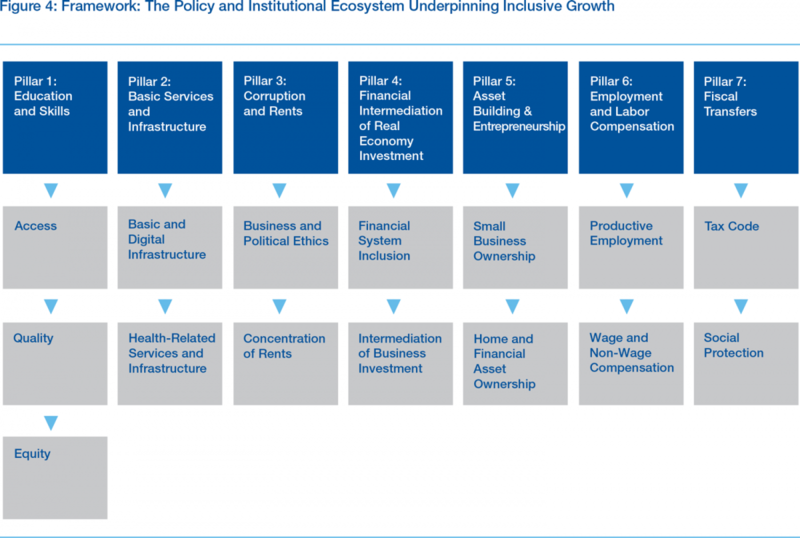 The policy and institutional domains portrayed in this Framework represent the ecosystem of structural policy incentives and institutions that together and as part of the growth process help to diffuse the benefits of an expanding national economy widely in terms of household income, opportunity, security, and quality of life. This ecosystem constitutes the implicit income distribution system – or, more precisely, living standards diffusion mechanism – underpinning modern market economies. When it performs properly, it tends to operate in a self-reinforcing cycle in which rising economic output and social inclusion feed each other. Fair and efficient taxation and basic social protections feature at the beginning and end of a continuing cycle within the development process. They are important not only for addressing excess inequality resulting from market outcomes but also for mobilizing resources to support crucial public services such as education and physical infrastructure, which are vital to the creation of economic opportunity, functioning of markets, and thus inception and ongoing stimulation of the growth process itself. Sound legal and competition institutions support efficient resource allocation and equal opportunity by preventing corruption, unduly high barriers to entry, and concentration of rents due to regulatory capture. Investment climate rules, incentives, and institutional capacity are important for enabling investors to capitalize on the level playing field created by robust legal and competition frameworks. They help channel savings efficiently to employment-generating and productivity-enhancing investment opportunities in the real economy as well as support consumer demand and small-scale entrepreneurship through widespread access to financial services. Core labor standards, worker protections, and benefits enable wages and household income to rise roughly in line with labor productivity, supporting domestic consumption and aggregate demand. They can also reinforce growth by supporting labor mobility, adjustment, and skills acquisition. Policies that support broad access to small business loans, housing finance, pension savings, and employee ownership help to democratize the generation of wealth and share the gains in national income from the economy’s technical progress and its accumulating capital stock. The accompanying wealth effect similarly stimulates domestic consumption and demand. If these key enabling factors are in place, a strong entrepreneurial and investment culture takes hold, fostering competitive industries and quality employment opportunities that in turn support domestic demand. Coming full circle, robust domestic demand spurs further investment and stimulates increases in growth via an efficient and fair tax system that generates the additional public resources needed to increase investment in the quality of the country’s basic services, infrastructure, and social safety net – widening economic opportunity and output still further. To help governments and stakeholders understand the extent to which this policy and institutional ecosystem has been optimized in their country, a database of cross-country statistical indicators has been compiled in each sub-pillar, permitting comparison at the pillar, sub-pillar, and individual indicator level within peer groups. These Policy and Institutional Indicators (PIIs) yield a distinct profile of each country’s institutional strength and utilization of policy space relative to its peers. These country profiles of benchmarking data are like diagnostic scans of each country’s structural policy and institutional enabling environment as it relates to their capacity to capture the synergies between growth and social inclusion. They illustrate the distance from best practice in their peer group in areas that particularly matter for driving broad-based progress in living standards. The results are presented in four groups of countries based on level of economic development as measured by national income. Tables 13-16 display the four groups of countries, comparing the pillar and sub-pillar scores of each country via a traffic-light shading scheme that ranks countries relative to their group. Red corresponds to the lowest relative performance within the group, yellow to the median, and dark green to the best performance. 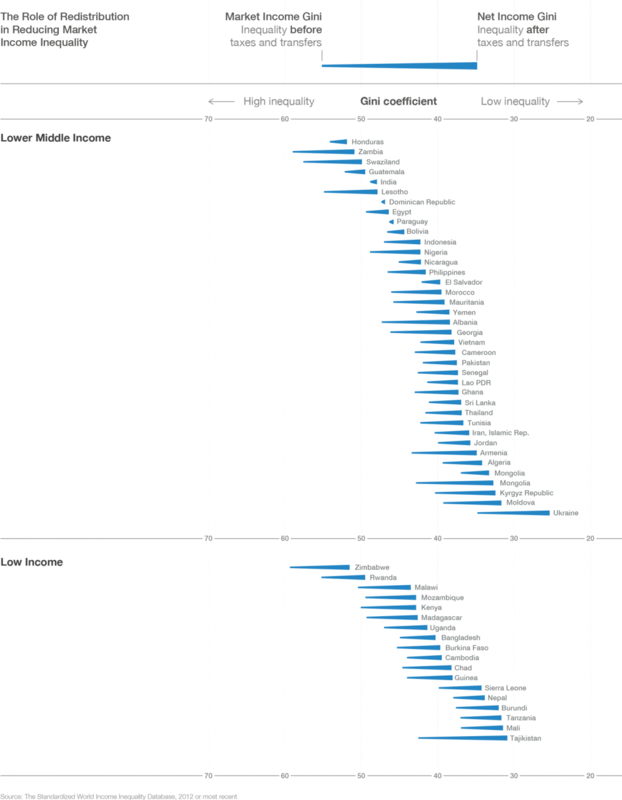 Since this color scheme ranks countries only within each comparator group, colors are not comparable across income groups. However, the absolute numerical score values (on a scale of 1 to 7) that are displayed in each data field are largely comparable across the entire sample of 109 countries. When countries are missing data, this is indicated by white shading and a numerical value of N/A. If data is missing for more than 30% of indicators, the sub-pillar score is also left blank. See Part 3 for a full description of the methodology. In addition to the cross-country sub-pillar tables presented in this Report, the version of the Report available online includes full individual country data profiles (wef.ch/igd17). These Country Profiles list the score for every indicator within every sub-pillar for each country covered by the Report. An example of a full country profile is included below in Part 2. This Framework represents an alternative way of thinking about structural economic reform and its role in the development process. Structural reform usually refers to measures aimed at boosting economic efficiency and macroeconomic stability by sharpening market signals and improving the health of public finances, often in response to a recent or looming fiscal or balance-of-payments crisis. In such circumstances, they tend to have the effect of squeezing living standards in the short term. But a systematic, sustained effort to strengthen institutions and policy incentives across the Framework’s 15 sub-domains – or to address particular weaknesses identified therein – also constitutes an exercise in structural reform, albeit one that mixes demand- and supply-side measures for the express purpose of boosting broad living standards while reinforcing the rate and resilience of growth. This rebalanced and enlarged notion of structural reform is best pursued as a long-term strategy forming an integral part of the development process rather than as a crash effort to preempt or recover from a crisis. 53 If a society is seeking a more inclusive model of economic growth, then the deliberate and progressive cultivation of institutional strength in these areas must be placed at the heart of its growth strategy, because these are the frameworks and mechanisms that constitute its economy’s implicit income distribution system – the mechanism by which the social benefits of economic growth are diffused widely in the form of broad-based progress in living standards (employment, income, security, and quality of life). The essential measure of the inclusiveness of a society’s growth model is the extent to which it produces broad gains in living standards before fiscal transfers. For this reason, six of the Framework’s seven main pillars relate to structural policy and institutional factors that influence the composition of private-sector activity and the distribution of outcomes within the market itself. In particular, because wages and returns to self-employment and small-business ownership constitute a very high percentage of the income of all but the wealthiest households, factors that shape these elements of national income figure prominently in the indicators that have been assembled. At the same time, since the focus of this exercise is inclusive growth and development rather than social inclusion per se, the set of policies and institutions it highlights and the specific benchmarking indicators it chooses must be consistent with the promotion of economic dynamism and growth. An inclusive growth strategy can only be effective if it reinforces, or at least does not undermine, incentives to work, save, and invest. This is a further reason why the Framework concentrates in large part, though by no means exclusively, on policy levers that influence relative incentives within the private sector rather than those that effect direct transfers through the public sector. Given the breadth and complexity of this policy ecosystem as well as the important role each country’s particular political economy plays in shaping it, there is no single ideal policy mix for the pursuit of inclusive growth. It is most important to view the entire spectrum of the Framework as an integrated system that merits deliberate cultivation as an integral part of the growth and development process with periodic upgrading to address weaknesses revealed in one part of the ecosystem or another. A culture of continuous improvement is required with respect to this policy and institutional ecosystem informed by evidence and experience. Indeed, as discussed in the presentation of these results below, no country excels across all 15 domains of the Framework. All have room for improvement and learning from peers. For this reason, the Framework weights all sub-pillars and pillars evenly, and refrains from providing rolled-up scores across the pillars. Figure 6 shows one facet of the considerable variation in emphasis by countries within this policy and institutional ecosystem. It illustrates the relative weight placed on pre- and post-transfer mechanisms (pillars 1-6 or pillar 7, respectively). Countries with comparable Gini ratios often achieve them through very different means, including very different levels of redistribution through the tax code and social insurance programs. Larger fiscal transfers are not necessarily incompatible with long-term growth and competitiveness, but neither are they always the primary or most effective available option for broadening socioeconomic inclusion. Many of the world’s most competitive economies have high levels of social protection and the significant tax burdens these imply. 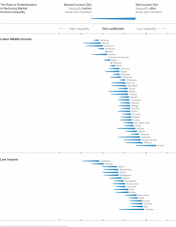 However, other countries achieve moderate or low Gini ratios mainly because their pre-transfer level of inequality is comparatively modest to begin with rather than due to the significance of their transfers. There is no inherent trade-off in economic policymaking between the promotion of social inclusion and that of long-term economic growth and competitiveness; it is possible to be pro-equity and pro-growth at the same time. Several of the strongest performers in the Forum’s Global Competitiveness Index (GCI) also have a relatively strong inclusive-growth and development profile. Policies and institutions supporting social inclusion are not solely a luxury of high-income countries. There is extensive overlap in absolute scores across at least three of the four income groups of countries in the sub-pillars of Business and Political Ethics, Tax Code, Financial System Inclusion, Intermediation of Business Investment, Productive Employment, Concentration of Rents, and Educational Quality and Equity. More fundamentally, when seen from a practical, evidence-based perspective,the current debate on inequality and social inclusion is unduly narrow and unnecessarily polemicized. It is possible, indeed essential, to be pro-labor and pro-business, to advocate a strengthening of both social inclusion and efficiency of markets through a stronger focus on institutions. The inequality debate focuses almost exclusively on up-skilling of labor and redistribution – when it moves beyond problem identification. For many countries, these may be among the most appropriate responses to widening dispersion of incomes, but they represent only a minority of the policy options available. To focus only on them is to miss the fuller opportunity to adapt or “structurally adjust” one’s economy to the challenge of strengthening the contribution of economic growth to broad-based progress in living standards in the face of forces such as technological change and global economic integration that can pull in the opposite direction. Other actionable options that are not traditionally thought of as equity-enhancing because they concern strengthening the enabling environment for real economy business investment and entrepreneurship can be just as critical to a country’s success in expanding employment, boosting wages, and widening asset ownership, which are central to advancing progress in living standards. The scaling and leveling effects of technology are increasing returns to capital and innovation. But while digitization in particular will continue to create enormous challenges for employment in many industries and countries, it also has the potential to create extensive opportunities for new entrepreneurs and small businesses by reducing barriers to entry and transaction costs as well as disintermediating and unbundling existing activities performed by larger organizations, including in international trade. Moreover, as manufacturing productivity improves and societies age, the market for services – many of which are less tradable across borders than goods – will expand, creating further opportunities for small-business ownership and asset building. Improving the regulatory and financial environment for running and investing in a small business can help a larger proportion of the working population to capture a larger share of these gains through the profits and equity appreciation that can accompany business ownership. Similarly, in today’s more internationally competitive and technologically dynamic environment, the effectiveness of private investment in the real economy is a critical determinant of a country’s ability to support productive industrial employment. This includes the cost, patience, and range of risk capital available for long-term investment in productive capacity and productivity improvements. Other critical determinants of the number and quality of employment opportunities include the quality and cost of infrastructure and basic services that link goods to markets and equip people for jobs, as well as the extent of deadweight losses to economic efficiency and innovation in the form of corruption and rents. A strategy to improve the enabling environment in these areas must be considered just as integral to the construction of a more inclusive model of economic growth as efforts to improve skills or fiscal transfers. 14 A. Kraay, “When is Growth Pro-Poor? 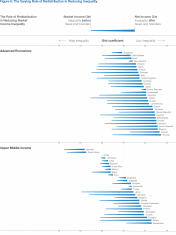 Evidence from a Panel of Countries,” Journal of Development Economics 80, No. 1 (2006): 198-227. 15 R. Rajan, Fault Lines: How Hidden Fractures Still Threaten the World Economy (Princeton, N.J.: Princeton University Press, 2010). 16 A.G. Berg and J.D. Ostry, “Inequality and Unsustainable Growth: Two Sides of the Same Coin?” IMF Staff Discussion Note 11/08 (2011), http://www.imf.org/external/pubs/ft/sdn/2011/sdn1108.pdf; J.D. Ostry et al., “Redistribution, Inequality, and Growth” (2014), http://www.imf.org/external/pubs/ft/sdn/2014/sdn1402.pdf. 17 L. Carvalho and A. Rezai, “Personal Income Inequality and Aggregate Demand,” Working Paper 2014-23, Department of Economics, University of São Paulo, São Paulo (2014). 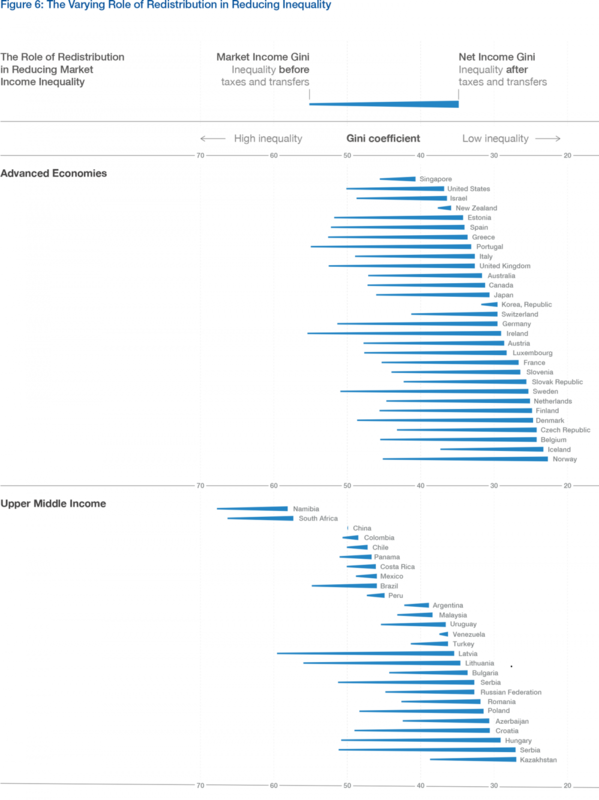 18 “Causes and Consequences of Income Inequality: A Global Perspective” (IMF, 2015), http://www.imf.org/external/pubs/ft/sdn/2015/sdn1513.pdf. 20 “Focus on Inequality and Growth” (OECD, December 2014), https://www.oecd.org/social/Focus-Inequality-and-Growth-2014.pdf. 21 Ibid; F. Cingano, “Trends in Income Inequality and Its Impact on Economic Growth,” OECD SEM Working Paper No. 163 (2014), www.oecd.org/els/workingpapers. 22 Robert Costanza, Maureen Hart, Stephen Posner, and John Talberth, “Beyond GDP: The Need for New Measures of Progress,” The Pardee Papers No. 4, January 2009, https://www.bu.edu/pardee/files/documents/PP-004-GDP.pdf. 23 Diane Coyle, GDP: A Brief but Affectionate History (Princeton University Press, 2015); Dirk Philipsen, The Little Big Number: How GDP Came to Rule the World and What to Do about It (Princeton University Press, 2015). 24 Robert J. Samuelson, “In Praise of the GDP,” Independent Record, May 16, 2016, http://helenair.com/news/opinion/in-praise-of-the-gdp/article_fa456e06-b95d-55bd-82c9-af6348f8c005.html. 25 See, for example, the case of Nigeria, where a statistical revision of GDP in 2014 meant that the country’s economy was calculated 89% bigger, even though its citizens were no wealthier. “How Nigeria’s economy grew by 89% overnight,” The Economist, April 8, 2014, http://www.economist.com/blogs/economist-explains/2014/04/economist-explains-2. 26 Joseph E. Stiglitz, Amartya Sen, and Jean-Paul Fitoussi, “Report by the Commission on the Measurement of Economic Performance and Social Progress,” http://library.bsl.org.au/jspui/bitstream/1/1267/1/Measurement_of_economic_performance_and_social_progress.pdf. 27 Professor Sir Charles Bean, Independent Review of UK Economic Statistics, March 2016, https://www.gov.uk/government/uploads/system/uploads/attachment_data/file/507081/2904936_Bean_Review_Web_Accessible.pdf. 28 Ibid. ; “Communications Market Report” (Ofcom, 2015), https://www.ofcom.org.uk/research-and-data/cmr/cmr15. 29 Diane Coyle, GDP: A Brief but Affectionate History (Princeton University Press, 2015); Dirk Philipsen, The Little Big Number: How GDP Came to Rule the World and What to Do about It (Princeton University Press, 2015). 30 Diane Coyle, “Digitally Disrupted GDP,” VOX, February 8, 2016, http://voxeu.org/article/digitally-disrupted-gdp. 31 Stefan Hall and James Pennington, “How Much is the Sharing Economy Worth to GDP?” (World Economic Forum, October 28, 2016), https://www.weforum.org/agenda/2016/10/what-s-the-sharing-economy-doing-to-gdp-numbers/. 32 Peter Coy, “The Rise of the Intangible Economy: U.S. GDP Counts R&D, Artistic Creation,” Bloomberg, July 18, 2013, https://www.bloomberg.com/news/articles/2013-07-18/the-rise-of-the-intangible-economy-u-dot-s-dot-gdp-counts-r-and-d-artistic-creation. 33 “Beyond GDP - New Measures for a New Economy” (Demos, 2011), http://www.demos.org/sites/default/files/publications/BeyondGDP_0.pdf. 34 Anna Bernasek, “Income Inequality, and Its Cost,” New York Times, June 25, 2006, http://www.nytimes.com/2006/06/25/business/yourmoney/25view.html. 35 D. J., Talberth, C. Cobb, et al. “The Genuine Progress Indicator 2006: A Tool for Sustainable Development” (Oakland, California: Redefining Progress, 2007), http://rprogress.org/publications/2007/GPI%202006.pdf. 36 Tim Callen, “Gross Domestic Product: An Economy’s All” (IMF, 2012), http://www.imf.org/external/pubs/ft/fandd/basics/gdp.htm. 37 Justin Fox, “The Economics of Well-Being” (Harvard Business Review, 2012), https://hbr.org/2012/01/the-economics-of-well-being. 38 Joseph E. Stiglitz, Amartya Sen, and Jean-Paul Fitoussi, “Report by the Commission on the Measurement of Economic Performance and Social Progress,” http://library.bsl.org.au/jspui/bitstream/1/1267/1/Measurement_of_economic_performance_and_social_progress.pdf. 40 Human Development Index, United Nations Development Programme, http://hdr.undp.org/en/content/human-development-index-hdi. 41 Angus Deaton, “Income, Health, and Well-Being around the World: Evidence from the Gallup World Poll.” Journal of Economic Perspectives 22, No. 2: 53-72. 45 R. Costanza et al, “Beyond GDP: The Need for New Measures of Progress,” The Pardee Papers Series, No. 4 (2009); M. Fleurbaey and D. Blanchet, Beyond GDP: Measuring Welfare and Assessing Sustainability (Oxford, Oxford University Press: 2013). 46 See, for example: http://www.economist.com/node/17079148, http://www.economist.com/news/finance-and-economics/21636749-what-ebenezer-scrooge-and-tiny-tim-can-tell-us-about-economics-joy-world and http://www.economist.com/news/briefing/21697845-gross-domestic-product-gdp-increasingly-poor-measure-prosperity-it-not-even. 47 See, in particular, Douglass C. North, “Institutions,” in Journal of Economic Perspectives 5, No. 1 (1991): 97-112; Institutions, Institutional Change and Economic Performance (Cambridge University Press, 1990). 48 More recently, Hall and Jones find that differences in capital accumulation and productivity, and therefore output per worker, are driven by differences in institutions and government policies. See R. Hall and C. Jones, “Why Do Some Countries Produce So Much More Output per Worker than Others?” The Quarterly Journal of Economics 114, No. 1 (1999): 83-116; Acemoglu, Johnson, and Robinson show that institutions are robustly related to present-day differences in per-capita incomes. See D. Acemoglu, S. Johnson, and J. Robinson, “The Colonial Origins of Comparative Development: An Empirical Investigation,” American Economic Review 91, No. 5 (2001): 1369-1401; D. Rodrik, A. Subramanian, and F. Trebbi also find that property rights are more important than either geography or trade in determining income levels around the world. See D. Rodrik, A. Subramanian, and F. Trebbi, “Institutions Rule: The Primacy of Institutions Over Geography and Integration in Economic Development,” Journal of Economic Growth 9, No. 2 (2004) 9: 131. 49 The East Asian Miracle (World Bank, 1993): 13-15, 157-89. 50 The Growth Report: Strategies for Sustained Growth and Inclusive Development (World Bank, 2008): 4-5. 51 A. Hicks, Social Democracy and Welfare Capitalism: A Century of Income Security Politics (Ithaca, NY: Cornell University Press, 1999). In the UK, the introduction of the welfare state rested largely on the work of John Maynard Keynes, who argued the virtues of full employment and state stimulation of the economy, and William Beveridge and the 1942 Beveridge Report, which spelled out a system of social insurance covering every citizen regardless of income and also resulted in compulsory, free secondary education for all, as well as the birth of the National Health Service. In the United States, from 1933-38, the New Deal ushered in a new era of reform spanning financial regulation, farm subsidies, public works, mortgage protection, union rights, Social Security, and the minimum wage. 52 Towards Green Growth (OECD, 2011); Tools for Delivering on Green Growth (OECD, 2011); and Towards a Green Economy: Pathways to Sustainable Development and Poverty Eradication (UNEP, 2011). The pursuit of a greener model of economic growth begins with a similar rebalancing of national strategy priorities supported by systematic consideration of available policy space across a wide spectrum of relevant policy and institutional domains. 53 R.G. Rajan, Fault Lines (Princeton, New Jersey: Princeton University Press, 2010).